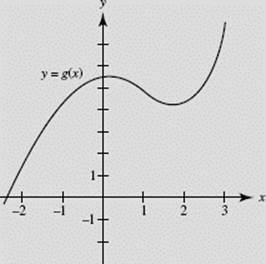 It is always possible to approximate the value of a definite integral, even when an integrand cannot be expressed in terms of elementary functions. 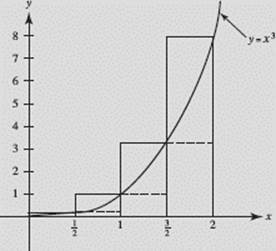 If f is nonnegative on [a, b], we interpret dx as the area bounded above by y = f (x), below by the x-axis, and vertically by the lines x = a andx = b. 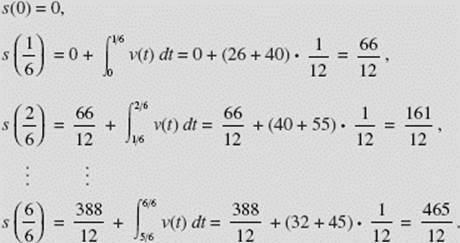 The value of the definite integral is then approximated by dividing the area into n strips, approximating the area of each strip by a rectangle or other geometric figure, then summing these approximations. We often divide the interval from a to b into n strips of equal width, but any strips will work. (1) Left sum: f (x0) Δx1 + f (x1) Δx2 + … + f (xn − 1) Δxn, using the value of f at the left endpoint of each subinterval. (2) Right sum: f (x1) Δx1 + f (x2) Δx2 + … + f (xn) Δxn, using the value of f at the right end of each subinterval. (3) Midpoint sum: using the value of f at the midpoint of each subinterval. These approximations are illustrated in Figures N6–4 and N6–5, which accompany Example 24. 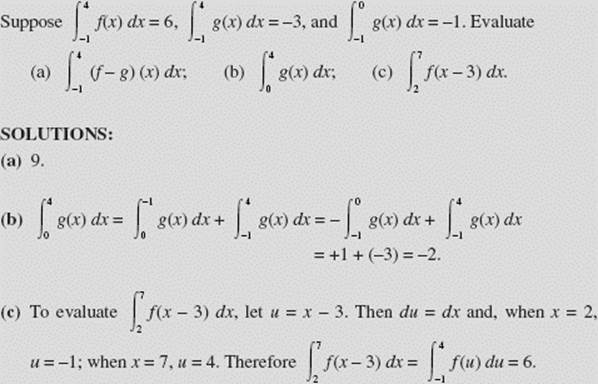 (c) the midpoint sum, and (d) the integral. The dashed lines in Figure N6–4 show the inscribed rectangles used. This sum uses the circumscribed rectangles shown in Figure N6–4. (d) Since the exact value of or 4, the midpoint sum is the best of the three approximations. This is usually the case. We now find the areas of the strips in Figure N6–6 by using trapezoids. We denote the bases of the trapezoids by y0, y1, y2, …, yn and the heights by Δx = h1, h2, …, hn. This is better than either L(4) or R(4), but M(4) is the best approximation here. SOLUTION: Note that the subinterval widths are not equal. From Figure N6–7 we infer that the area of a trapezoid is less than the true area if the graph of f is concave down, but is more than the true area if the graph of f is concave up. Figure N6–8 is helpful in showing how the area of a midpoint rectangle compares with that of a trapezoid and with the true area. Our graph here is concave down. 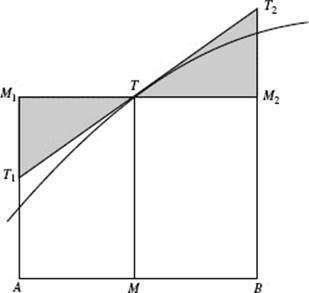 If M is the midpoint of AB, then the midpoint rectangle is AM1 M2 B. We’ve drawn T1 T2 tangent to the curve at T (where the midpoint ordinate intersects the curve). Since the shaded triangles have equal areas, we see that area AM1 M2 B = area AT1 T2 B.† But area AT1 T2 B clearly exceeds the true area, as does the area of the midpoint rectangle. This fact justifies the right half of the inequality below; Figure N6–7verifies the left half. 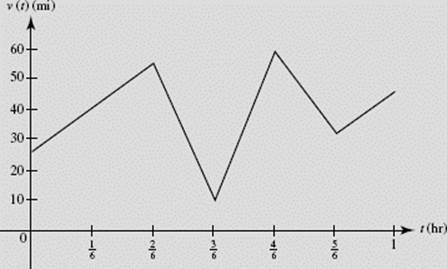 Write an inequality including L(n), R(n), M(n), T(n), and for the graph of f shown in Figure N6–9. † Note that the trapezoid AT1 T2 B is different from the trapezoids in Figure N6–7, which are like the ones we use in applying the trapezoid rule. 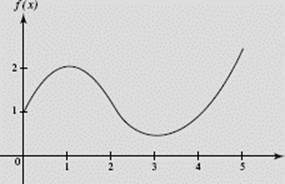 Figure N6–10 is the graph of function f ′(x); it consists of two line segments and a semicircle. 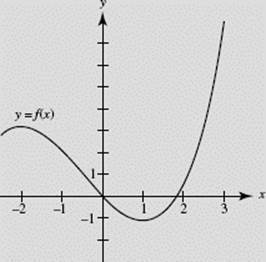 If f (0) = 1, sketch the graph of f (x). Identify any critical or inflection points of f and give their coordinates. 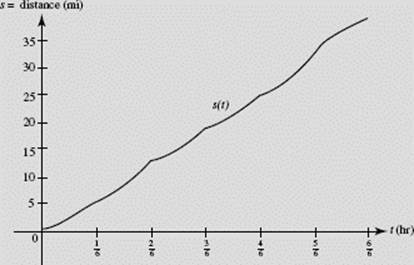 the graph of f is concave up on [2,5], because f ′ is increasing. Additionally, Since f ′(1) = f ′(3) = 0, f has critical points at x = 1 and x = 3. As x passes through 1, the sign of f ′ changes from positive to negative; as x passes through 3, the sign of f ′ changes from negative to positive. Therefore f (1) is a local maximum and f (3) a local minimum. 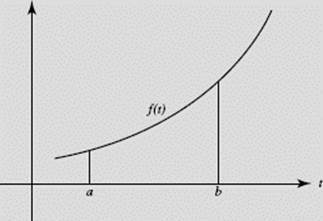 Since fchanges from concave down to concave up at x = 2, there is an inflection point on the graph of f there. 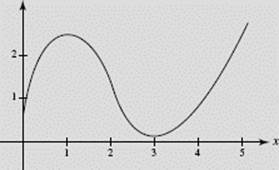 These conclusions enable us to get the general shape of the curve, as displayed in Figure N6–11a. All that remains is to evaluate f (x) at x = 1, 2, and 3. 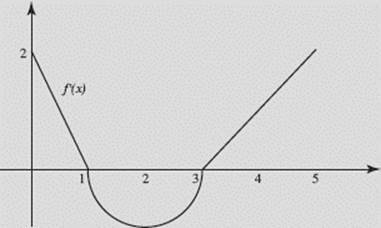 We use the Fundamental Theorem of Calculus to accomplish this, finding f also at x = 4 and 5 for completeness. So the function f (x) has a local maximum at (1,2), a point of inflection at (2,1.2), and a local minimum at (3,0.4) where we have rounded to one decimal place when necessary. In Figure N6–11b, the graph of f is shown again, but now it incorporates the information just obtained using the FTC. 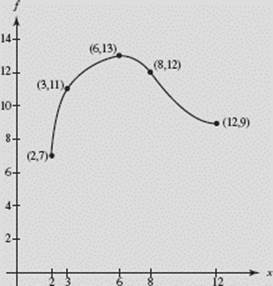 (a) Draw a graph that could represent the car’s speed during the hour. (b) Approximate the distance traveled, using L(6), R(6), and T(6). (c) Draw a graph that could represent the distance traveled during the hour. 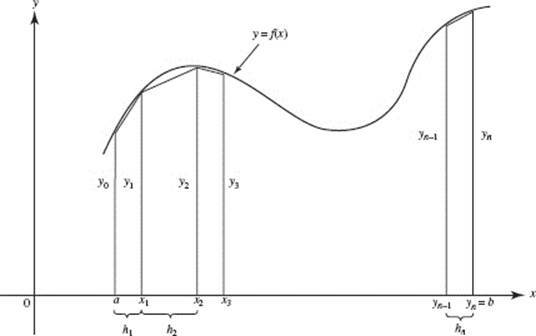 (a) Any number of curves will do. 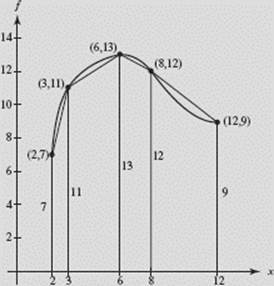 The graph has only to pass through the points given in the table of speeds, as does the graph in Figure N6–12a. Figure N6–12b is one possible graph for the distance covered during the hour. SOLUTION: We evaluate F(x) by finding areas of appropriate regions. 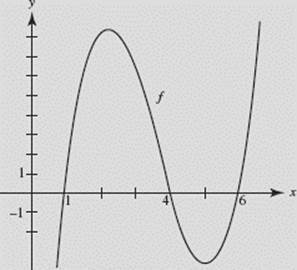 The graph of the function f(t) is shown in Figure N6–14. 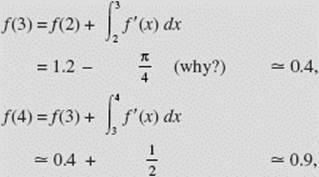 (i) If 4 < x < 6, F(x) > 0. 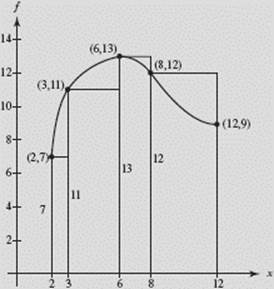 (ii) If 4 < x < 5, F ′(x) > 0. (iii) F ″(6) < 0.
it follows that F(x) > 0 if 4 < x < 6. (ii) is false. Since F ′(x) = f (x) and f (x) < 0 if 4 < x < 5, then F ′(x) < 0. (iii) is false. Since F ′(x) = f (x), F ″ (x) = f ′(x). 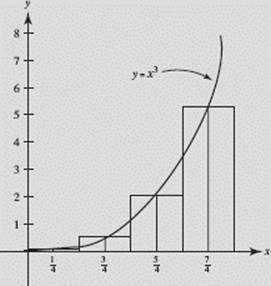 At x = 6, f ′(x) > 0 (because f is increasing). Therefore, F ″(6) > 0. Which of these statements is (are) true? I is true since, for example, f (x) = 0 for the critical values of g: f is positive where g increases, negative where g decreases, and so on. II is true for similar reasons. III is also true. Verify that the value of the integral g(x) increases on the interval −2.5 < x < 0 (where f > 0), decreases between the zeros of f (where f < 0), then increases again when f becomes positive. Assume the world use of copper has been increasing at a rate given by f (t) = 1.5e0.015t, where t is measured in years, with t = 0 the beginning of 2000, and f (t) is measured in millions of tons per year. 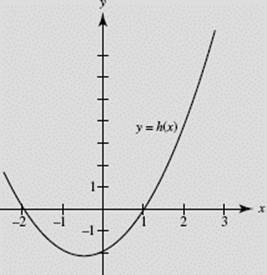 (a) What definite integral gives the total amount of copper that was used for the 5-year period from t = 0 to the beginning of the year 2005? (b) Write out the terms in the left sum L(5) for the integral in (a). What do the individual terms of L(5) mean in terms of the world use of copper? (c) How good an approximation is L(5) for the definite integral in (a)? (b) L(5) = 15e0.015 · 0 + 15e0.015 · 1 + 15e0.015 · 2 + 15e0.015 · 3 + 15e0.015 · 4. The five terms on the right represent the world’s use of copper for the 5 years from 2000 until 2005. (c) The answer to (a), using our calculator, is 77.884 million tons. L(5) = 77.301 million tons, so L(5) underestimates the projected world use of copper during the 5-year period by approximately 583,000 tons. Example 32 is an excellent instance of the FTC: if f = F ′ then gives the total change in F as x varies from a to b.